Daniel Salel and Joan Chelimo. 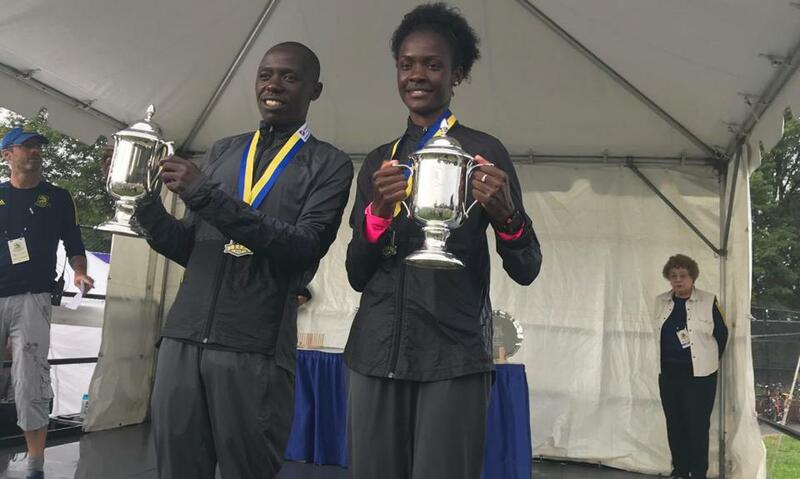 The Boston Athletic Association Half Marathon Sunday was a sweep for a pair of 26-year-old Kenyans. Daniel Salel won his third consecutive race in 1 hour 4 minutes 31 seconds, taking home the first prize of $10,000. It was the first title for Joan Chelimo, who won in 1:10:31, but who also picked up a $20,000 bonus for winning her second BAA event. It was 70 degrees and humid when the race began in Franklin Park, the only signs of fall scattered golden tips on the trees along the Emerald Necklace. The pace of the men’s race was slow, as a lead pack of about 15 ran out of the park in a 4:57 first mile. Abdi Abdirahman, the first American to finish, claiming fifth in 1:05:11, went to the front and tried to push the pace, but the other runners simply surrounded him and refused to speed up. “I knew it was comfortable [pace], I just wanted to test how everyone’s feeling and they will come with me and then I thought we were going to pick up the pace,’’ Abdirahman said. “They kind of slowed down. Salel stayed near the front of the lead pack, which began dropping runners after splits of 4:48 and 4:49 in Miles 10 and 11. When the runners entered the loop through Franklin Park Zoo, the pack had been cut to five. All five were working hard as Salel finally began to push. By the time Salel flew down the track to the finish line in White Stadium, he was 100 meters ahead of runner-up Suguru Osako of Japan (1:04:42). Tesfalem Gebrearegawi of Ethiopia was third (1:04:45) and Shogo Nakamura of Japan was fourth (1:04:50). Salel said the pace was slow until about the 15k mark, which the leaders passed in 46:32. At the loop through the zoo after Mile 11, Salel knew to keep pushing. After five years in this race, including second-place finishes in 2013 and 2014, he knows the course well. Salel, who said he might run the Boston Marathon next year, finished well back of the course record time of 1:00:34. “The time wasn’t spectacular but the competition was good,’’ said Abdirahman. The women’s race began at a record pace as Chelimo, who led start to finish, sped away from the start line and quickly joined up with the men’s lead pack for the first mile. Chelimo had plenty of incentive, with the big bonus dangling in front of her. Diane Nukuri of Burundi was almost a minute behind Chelimo in 1:11:21, followed by Ethiopians Biruktayit Degefa (1:11:40) and Buze Diriba (1:13:04). Katie Matthews, 26 and a BU grad, was the first American woman, finishing fifth in 1:16:55. Soon enough, Chelimo was running all alone. 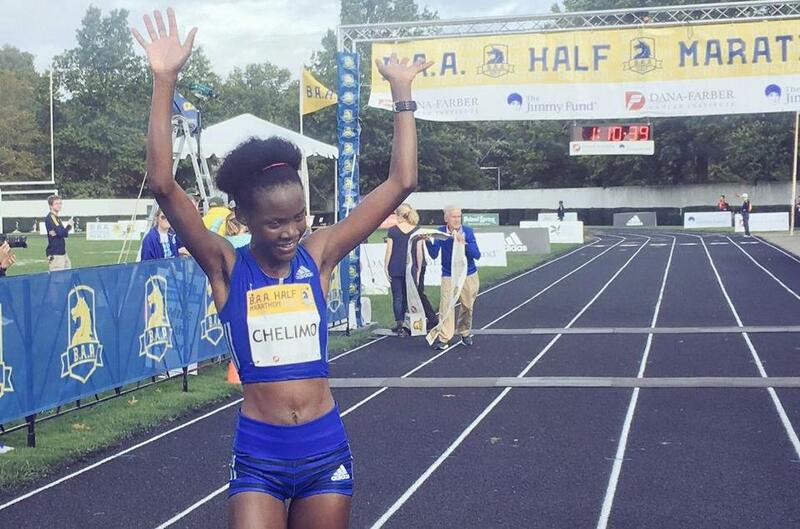 Like Salel, Chelimo sees a Boston Marathon in her future, perhaps in 2019. It is, after all, her lucky city. Joan Chelimo’s margin of victory was 50 seconds.